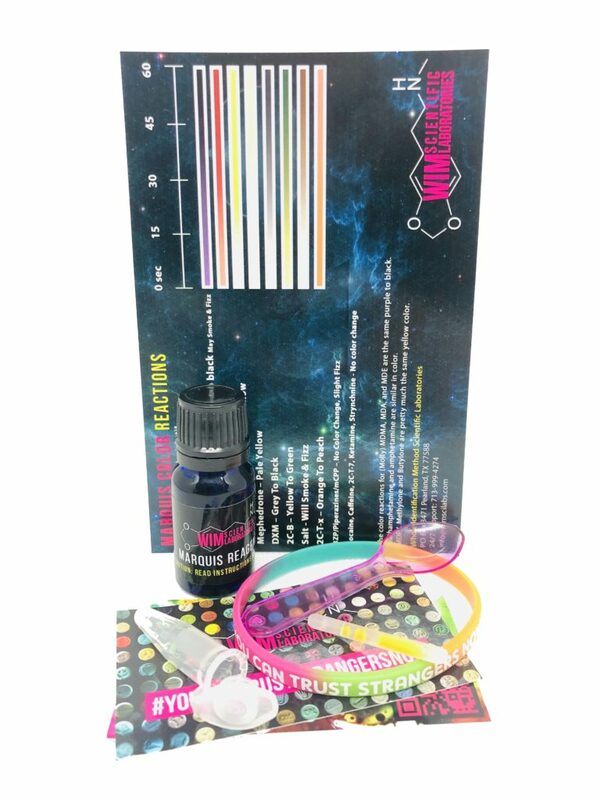 Unlike other Marquis Reagent Providers we provide you with everything you need to identify illicit substances and compounds. WIM Scientific Laboratories makes use of superior laboratory chemicals and extensive attention to detail, ensuring that your marquis reagent will react in a dependable and decisive way for each test. All WIM Scientific Lab analytical reagents are made to order and not stored for long periods in third party distribution centers. 1/2 Oz (15ml) of USA factory sealed ISO 9001 Quality Lab Material Certified Dropper bottle. Contains over 200 individual tests! Our contact info in case you need us 24/7 for anything, have any issues, comments, questions, concerns. Remove the reagent bottle from the child proof safety container. The packing absorbent can be throw away. Carefully open the Marquis Reagent’s factory sealed cap. Add one or two drops of the Marquis Reagent into the testing vile. Got my kits in today, shipping was super fast and the tests worked. No problems at all, will be ordering again. The test works smoothly and the directions are super easy to follow! Test is great thank you.